(Reuters) - Dutch navigation and digital maps firm TomTom on Wednesday reported a forecast-beating 14 percent rise in first-quarter revenue and said it had won two contracts to supply high-definition maps to carmakers. "We had a good start of the year, winning the first two available HD map deals, which gives us an early position in this growth market," said CEO Harold Goddijn in a statement. TomTom in January agreed to sell its fleet management business to Japan's Bridgestone for 910 million euros, in order to concentrate on its digital map-linked businesses, which it has said it expects to grow by around 15 percent to 430 million euros in 2019. TomTom's prospects took a huge knock last year with the entry of Google's far-reaching supply deal with a group of carmakers including Renault, Nissan and Mitsubishi . The Amsterdam-based company also faces a long-term decline in the sales of dashboard-mounted satnav devices. TomTom said the HD contracts were with two of the world's largest car companies but gave no further detail. FREMONT, California, April 17, 2019 — (PRNewswire) — According to a new market intelligence report by BIS Research titled " Global Mobile Robot Market - Analysis and Forecast 2018-2023", the global mobile robot is projected to reach $9.90 billion by 2023, witnessing a CAGR of 19.67% during the forecast period, 2018-2023. The market is likely to showcase a high growth rate owing to the increased need for organizational efficiency and accuracy, rising labor cost and unavailability of skilled labor, and progress in both software, including cognitive technologies, and hardware, particularly sensors, actuators, and batteries. Browse 22 Market Data Tables and 247 Figures spread through 308 Pages, and in-depth TOC on ' Global Mobile Robot Market '. The advancements in robotics, artificial intelligence, and machine learning are ushering in a new age of automation in which robots are likely be able to perform a range of routine physical work activities. These robots are also becoming increasingly capable of accomplishing activities that include cognitive capabilities, sensing emotion, making tactical judgments, and even driving activities that were earlier considered to be fairly difficult to automate successfully. APRIL 18, 2019 -- CoreLogic® (NYSE: CLGX), a leading global property analytics solutions provider, today announced an expanded integration of data products from Ecopia Tech Corporation (Ecopia.AI), increasing its coverage of building footprints from 85+ million to 169+ million across the country. By ingesting Ecopia.AI’s building footprints, and associating CoreLogic property attributes to each footprint, the resulting Structure Footprint offering is the most comprehensive roof-top location intelligence solution available today. Unique to CoreLogic, the Structure Footprint product identifies not only the location and outline of relevant structures on a parcel, it also assigns known addresses associated with the structure, and includes universally unique structure identifications. The expanded integration of Ecopia U.S. Building Footprints means CoreLogic can now offer complete continental U.S. coverage paired with precise and detailed structure attributes such as gross square footage, land use, number of stories and year built; fueling enhanced risk assessment and granular location-based decision-making. Dublin, April 17, 2019 (GLOBE NEWSWIRE) -- The "Global UAS Traffic Management (UTM) System Market: Focus on Stakeholders Analysis, Key Technologies Enabling UTM, and Country-Wise UTM Concepts" report has been added to ResearchAndMarkets.com's offering. The UAS traffic management (UTM) system market is in its developmental phase. Since 2014, NASA, along with UAS community partners, industry leaders, various governments, and academic researchers, are actively developing and testing the unmanned traffic management research platform. Many successful tests and demonstrations for communication prototypes, beyond visual line of sight (BVLOS) operations, mission planning, and longer range application prove that a commercialized market for unmanned traffic management is gradually emerging. Moreover, the need for UTM services has also resulted in the development of regulatory framework for the deployment drones around the world. This regulatory framework is expected to include operational limits, key responsibilities of the stakeholders, aircraft requirements, etc. Governments and regulatory authorities have made some exemptions in 2018 with regard to the operation of commercial UAVs, which has been a driving factor in the UAV market growth. Thousands of onlookers on the banks of the River Seine were stunned into silence as a fire engulfed the World Heritage Site on Monday. Firefighters said they believed the fire began in the attic of the cathedral. They scrambled to rescue valuable pieces of historical art from inside the building. The cathedral’s spire collapsed in the flames, which spread to one of its rectangular towers, followed by its roof. Stay with us throughout the day for more updates. Times are UTC+4. TAMPA, Fla., April 16, 2019 — (PRNewswire) — SiteZeus is excited to be at the forefront of a transformative change occurring within the location intelligence sector. Its artificial intelligence-powered platforms are providing solutions that are helping introduce emerging and established brands to a new age of Prescriptive-Led Growth (PLG). So, what is PLG? Simply put, PLG is prescribing location-based decisions to unique brands with the use of A.I and machine learning. Prescriptive-Led Growth represents a seismic shift in bringing science to the often-complex questions of location intelligence. How many stores can I open in a market to leverage the full market potential? How will sales be impacted if I open a second location five miles away? PLG replaces the educated guesses of predictive analytics with highly accurate, data-driven answers. "Importantly, companies need to recognize that this is more than just new disruptive technology. It represents a paradigm shift in the way companies think about location intelligence," said Hannibal Baldwin, Co-Founder at SiteZeus. "Those that don't recognize that shift run the risk of being at a disadvantage and losing out to competitors in what has become a highly competitive business environment where companies are increasingly relying on data-driven decisions." PROVIDENCE, R.I. — (BUSINESS WIRE) — April 17, 2019 — Textron Inc. (NYSE: TXT) today reported first quarter 2019 net income of $0.76 per share, compared to $0.72 per share in the first quarter of 2018. “Our results in the quarter were driven by growth and performance at Aviation and continued strong execution at Bell, which resulted in significant margin improvements at those segments,” said Textron Chairman and CEO Scott C. Donnelly. Net cash used by operating activities of the manufacturing group for the first quarter totaled $196 million, compared to $53 million of net cash used last year. Manufacturing cash flow before pension contributions, a non-GAAP measure that is defined and reconciled to GAAP in an attachment to this release, reflected a use of cash of $291 million compared to a use of cash of $158 million last year. In the quarter, Textron returned $202 million to shareholders through share repurchases. 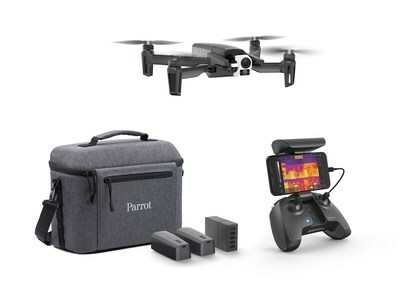 PARIS, April 16, 2019 — (PRNewswire) — Parrot, the leading European drone group, has launched ANAFI Thermal: a new drone capable of capturing both live and recorded 4K HD video and thermal imaging of surfaces, structures and potentially dangerous areas for professional uses. The drone utilizes Parrot's highly successful ANAFI drone platform and equips it with a built-in 4K HDR camera with a 21-megapixel Sony sensor, as well as a FLIR® radiometric thermal-imaging camera, complete with 160x120 resolution and a temperature range of 14°F to 752°F (-10°C to 400°C). ANAFI Thermal's gimbal can tilt vertically 90° upward or downward, giving professionals an unprecedented field of view. A 3X digital zoom allows pilots to examine hard-to-access areas without taking unnecessary risks. The drone's visible and thermal light spectrum cameras are stabilized on three axes, allowing for sharp videos and clear pictures in any flight conditions. ANAFI Thermal is 10g lighter than previous ANAFI drones and 2cm smaller with an ultra-compact, folding design for easy storage and portability. Hallowell, Maine – April 16, 2019 - Blue Marble Geographics ( bluemarblegeo.com) is pleased to announce that is innovative mobile mapping application, Global Mapper Mobile, is now available to U.S. government agencies through the Innovative GEOINT Application Provider Program (IGAPP). Administered by the NGA (National Geospatial-Intelligence Agency), the mission of IGAPP is to streamline the deployment of commercial mobile apps to government personnel by bridging the gap between traditional government contracting procedures and non-traditional businesses. Available on both iOS and Android platforms, Global Mapper Mobile enables remote access to mission-critical geospatial datasets in an easy-to-use application. Used in conjunction with the desktop version of the software, Global Mapper Mobile supports hundreds of GIS data formats – both raster and vector – and offers simple, form-based field data collection and geotagged photo capture.